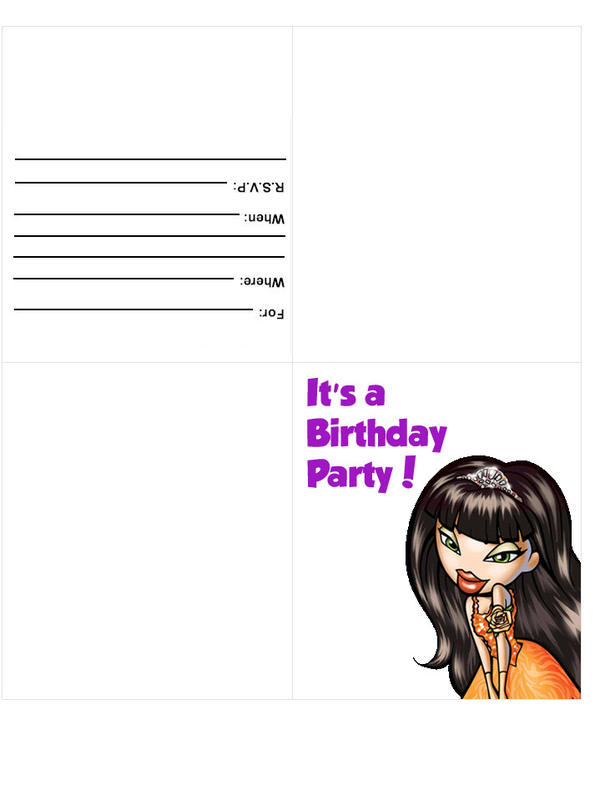 We found many ideas on other websites to organize a fun Bratz birhday party. You will find how to make invitations. 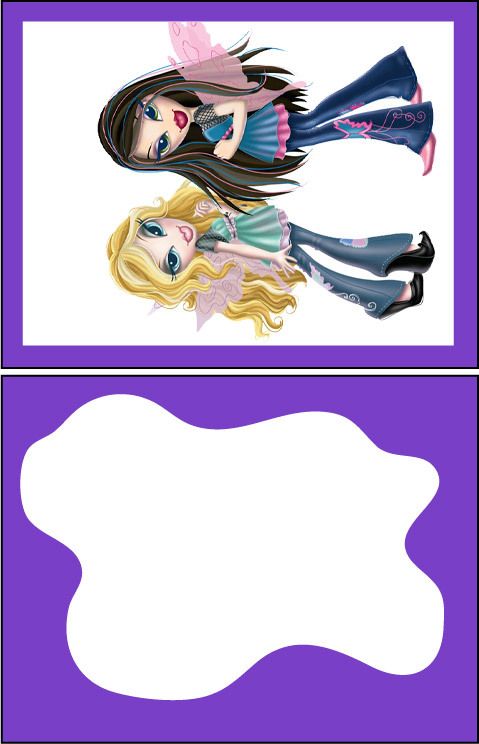 Printable Bratz cards, envelopes, bags and more. Also delicious Bratz foods and drinks. 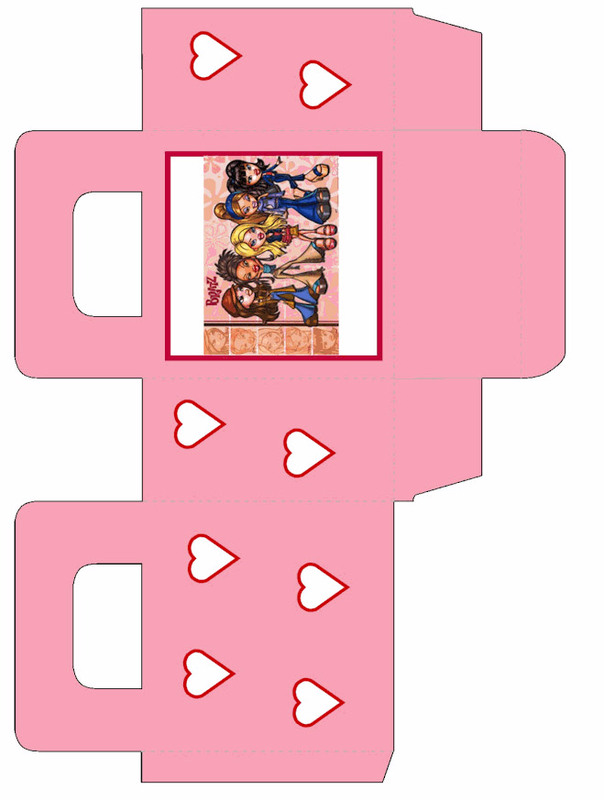 And a lot of Bratz party game ideas to have a great time on your party! 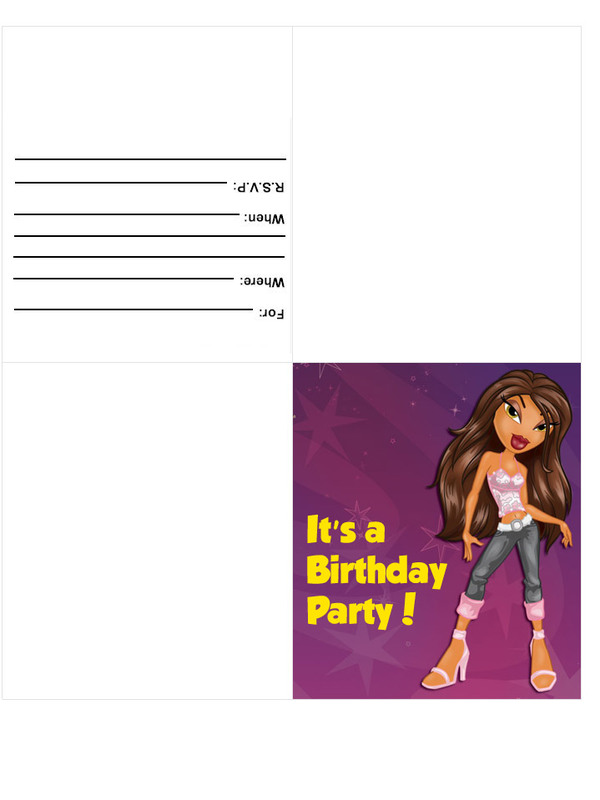 You can either print out some free invitations online , make your own on a computer ( use some free Bratz clip-art ) , or you can make some with card stock. Use some glitter glue to glam it up a bit , and for that extra special touch why not tie a glam lipstick or nail polish to each invite with a pretty ribbon. A bratz party is all about girls - so you will need lots of pink & purple streamers & balloons. Grab some feather boas from the dollar store & hang them here and there. A disco ball and lots of mirrors around would be fun. You can purchase matching Bratz plates ,cups , napkins etc or you can just use some pretty pink & purple ones. Add some sequins underneath a clear plastic tablecloth to glam up your table ( for a cute centerpiece you could use some helium balloons weighted down with a cute purse ) Hang up a bunch of Bratz Pictures or Bratz coloring pages. Use fashion items like shoes, purses, feather boas, scarves, and jewelry to decorate. Try and make the party area look like a shopping mall. Have signs on doors that say fitting room, accessories, store names, etc. Put out any Bratz toys items that you have on tables for decoration. 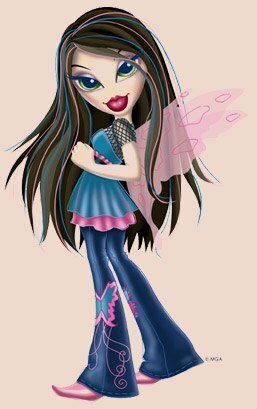 If you aren't sure what teen fashion is all about take a look at some of the Bratz sites for a little insight. If Yasmin, Jade, Sasha and Cloe are wearing it... you're good to go. The best colors for your Bratz birthday party decorations are pink, purple, silver, gold and baby blue. Have plenty of balloons and crepe paper streamers inside and outside in above-mentioned colors! Make a ribbon curtain for your doorway for the guests to walk through! Hang silver and blue stars on the fishing line from the ceiling in your Bratz party area. Decorate your party walls with Bratz posters. Spread such items as lipstick, make-up accessories, glitter, nail polish, etc. around the house. You can use old purses as 'weights' for the balloons. Cover your party table with a cloth in party colors. Spread confetti all over the table and decorate it with curly ribbon strips. Bring out any Bratz dolls that your child might have and put them on the table as centerpiece. Hang a 'Happy Birthday" banner on the wall in the table area. Star-shaped placemats underneath the plates will be a great addition to your table decor. You can rent a helium tank (if possible) and make impressive helium balloons. Tie the balloons to the backs of the chairs. For this craft you will need fine glitter in a couple different colors, aloe Vera gel, small containers with lids and fun fashion related stickers. Give each kid a little bit of aloe vera gel and glitter. Let them stir it with a Popsicle stick. Give them stickers to decorate the container. Get white cotton fabric and fabric pens. Cover the table just in case the pens run through. Cut the fabric into squares big enough for the girls to wrap around their heads. Then let them decorate their own scarf. Mix together in microwave safe bowl and heat on HIGH 15 seconds at a time, until melted. Pour into small containers and refrigerate 45 minutes. (You can get those clear round plastic containers with screwtop lids at Michaels. I think they each hold about 2 ounces, and they are usually near the paint section.) Caution: This is for glossy lips only. This will not provide any protection from the sun at all. Have the kids make their own jewelry - necklaces , rings , bracelets or whatever - lots of great craft supplies for this can be found at your local dollar store. Provide the kids with lots of dress-up clothes. Have an area set up to take "glamorous pictures" and take pictures with a digital camera. A nice gesture is to include each little guest's photo in the "Thank You" note sent after the party. Play fun hip hop music and let the kids dance. When the music stops they all have to freeze. Video tape the dance and let them watch it while they are eating their treats. Play like Hot Potato - Before the party go to a thrift store and purchase a really funky shoe - then take it home and decorate it with some glitter/feathers etc. To play: This game is just like hot potatoe - pass the shoe around a circle while music is playing ( hip-hop is best ) , with your back turned stop the music frequently - whoever gets caught with the Sugar Shoe is out , keep going until the last person is left - then they get a prize. Play music and pass nailpolish around a circle - with your back turned shut the music off frequently - everytime the music stops the person with the nailpolish has to paint one of their toes - the winner is the person who gets all ten toes painted ! Involve other moms in this activity if you can. Set up tubs with water and hand towels on the table. Help the girls get their nails done. Cut cucumber slices for "facial treatment" and allow the kids to use moisturizer creams. You can spread scented candles in the 'spa area' for authentic atmosphere. 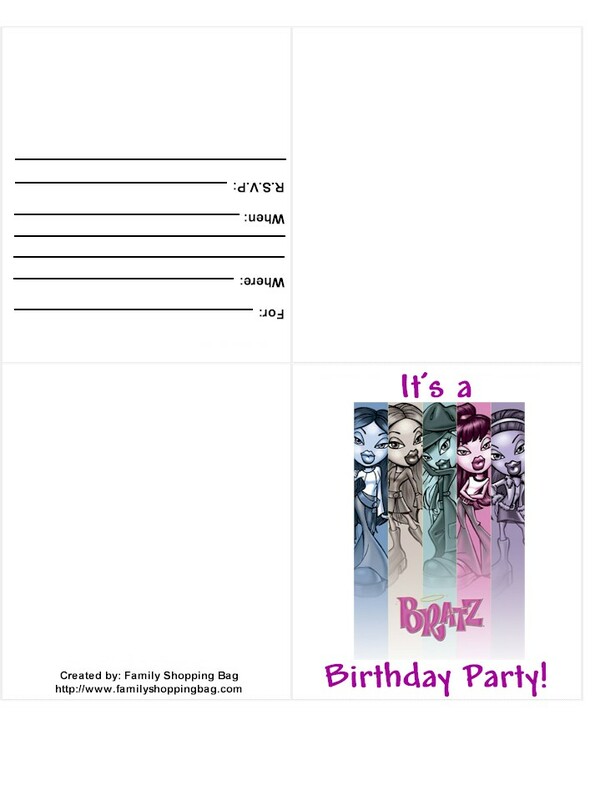 For this cool Bratz birthday party game you'll need balloons (about 2 per guest), small pieces of paper, large garbage bags, and a small prize.Before the party, write a name of clothing item (e.g. 'skirt', 'shoes', 'capris', etc.) on pieces of paper. On one of the paper pieces write down "Fashion Star". Blow up the balloons and insert the paper pieces inside separate balloons.Put the inflated balloons inside garbage bags. Explain to the party guests that the purpose of the game is to find a "Fashion Star" note by sitting (not stomping) on the balloons. Next, release the balloons and let the fun begin. Whoever finds the "Fashion Star" note gets a small prize. Fill a pretty purse with 15-20 fashionable items (e.g. Lil' Bratz dolls, jewelry, hairclip, comb, lipstick, etc). Split the group into pairs. Blindfold the team of 2 girls at a time. Allow them to feel through the purse with their hands trying to recognize the items (without naming items out loud). Next, invite them to a separate room where they can discuss and write down all the items they think are inside the purse. The pair that gets the most items right - wins. Provide pink (if possible) sunglasses for your 'Bratz Pack'. They can decorate their shades with glitter, beads, etc. This Bratz birthday party activity will be a hit with girls! Put on some party music and get 2 helpers hold a limbo stick while everyone in the group does the limbo. People holding the stick will lower it every round. The rules are simple: if you touch the ground with anything but your feet or you bump a floor - you're out! Print out a picture of Jasmine and some funky lips and play this like pin the tail on the donkey. Give the kids some of your old high heels and have them do a race - just be careful - we don't want any broken ankles ! 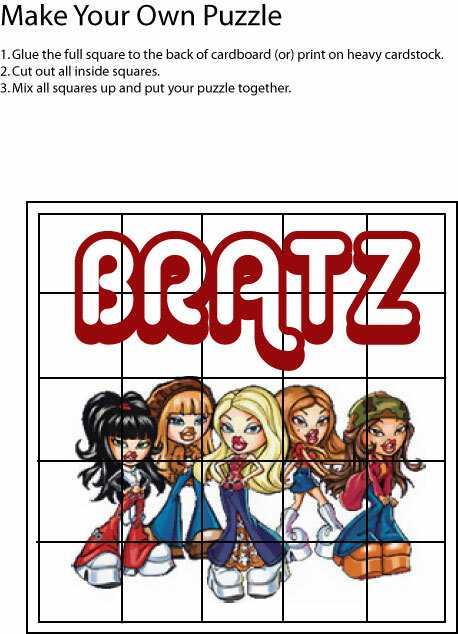 This is one of the more interesting Bratz party games and makes a fun puzzle game that will take all the hands and minds of your guests to solve. 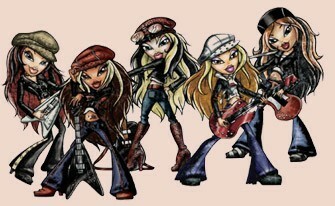 Have all the Bratz players stand in a circle with their hands place in the center of the group. This can only be used for up to ten people, because the circle starts to get too big otherwise. With everyone in a circle have the players close their eyes and hold hands with one of the many other hands in the circle. Keep your eyes closed as you are doing this and do not to hold hands with some one close to you or hold both hands with the same person. Each hand holds a different hand. Once everyone is holding hands, you can all open your eyes and try to undo the knot that’s been created by rearranging yourselves and getting back into a circle. Don’t worry about keeping a death grip on the hands you are holding, its good enough to maintain hand contact with that person. Be aware that you may never solve the Bratz party games knot no matter how hard you try, but it is fun. With some simple fabrics, already cut into the right sizes, you can let the girls design their own Bratz clothing. They can accessorize the clothing, add what they think will work great and put it together in a cool way. This will help the girls work together and it will be a lot of fun as they try out different looks to see how much they have a passion for fashion. Create fashionable treats for this party. Make smoothies and serve them in neat glasses with little umbrellas. You can make a lot of different flavors by putting in different flavored ice cream or adding things like candy bars and fruit. Make a platter of meats and cheeses. Roll the slices and keep them rolled with a toothpick. The other option is to go for the classic teen foods: mini pizzas, French fries, and soda pop. You’ll find that there are lots of takers for pizza! Make it fun by writing out the word ‘bratz’ or simply the letter ‘B’ in pepperoni or some other pizza topping. On the appetizer side make up some zesty Jalapeño cheesy bites cause you know those Bratz got spice. After the meal cool everyone off with some vanilla or chocolate ice cream and sit down to watch a few episodes of the Bratz series. Jalapeño Cheesy Bites are easy to make for your Bratz Birthday party and they always make a great snack. Depending on how hot you like your pepper, choose about 10 to 12 jalapeños or a milder tomato pepper for your bites. Wash them. Slice opens the sides and remove the seeds which are inside. Then spoon in a mix of cream cheese, and cheddar cheese. Place the filled bites in the fridge to cool. Meanwhile prepare a purchased breading mix according to instructions. Take the cold peppers out of the fridge and bread them as the directions suggest. Place breaded Jalapeño bites on a pan and pop in oven at about 350 degrees until the breading is golden. Some cheese may leak out of the Bratz Jalapeño bites as they warm up. Above all, have FUN and don't forget to take lots of photos.